Comfy home opp Gilmour Lake. ‘Lakewood 5’ is a 2 bedroom, 1 bathroom, very comfortable home built in 2014. The tinted bi-fold doors are north facing and open onto the deck. East facing ranch sliders look out to Gilmour Lake and you can bbq out here while watching the sun set. The lounge has a Smart TV, DVD, CD’s for you pleasure and the heat pump in the cooler months will keep you nice and cosy and warm. Behind Gilmour Lake and within 500 metres of the house is the Blackhill walking/clyce track. If you are into the outdoors then the Karangahake Gorge is just a short distance and the walking/tramping tracks around Waihi and Dickies Flat are definitely worth the effort. Waihi has the only working open cast mine that is in the middle of a town in New Zealand and also has a walking/cycle track around the circumference and is about 1 km from the house. Not to mention Waihi Beach, 10 km of white sands and Pacific Ocean. By car it is only 10 minutes away. A beautiful beach and small village with eateries aplenty to wet your appetite especially after all that exercise!!! Waihi Beach has one of the biggest RSA’s in the land and the view is to die for. Waihi is only 40 minutes to our nearest city – Tauranga and only 1 and a half hours to Auckland so we really are in the hub of things. Don’t delay, book now for that weekend away to explore all that Waihi and its surrounding areas has to give. The property is modern, warm and is in a nice area. We very much enjoyed our stay at John and Brenda's modern home. We had everything we needed and they left us their contact details incase we had any questions. The shower was beautiful. The home was warm and there was a heat pump if we needed it. We really liked the right of way where the home is situated. We would be very happy to stay at this lovely home in the future. Our guests were very easy to deal with easy to communicate with and left the house spotlessly clean very pleased they enjoyed the beach hop and local amenities.Would have no hesitation in renting the house them in the future. John and Brenda were very welcoming on our arrival and happily provided us with sheets that we had not noticed we needed to bring. 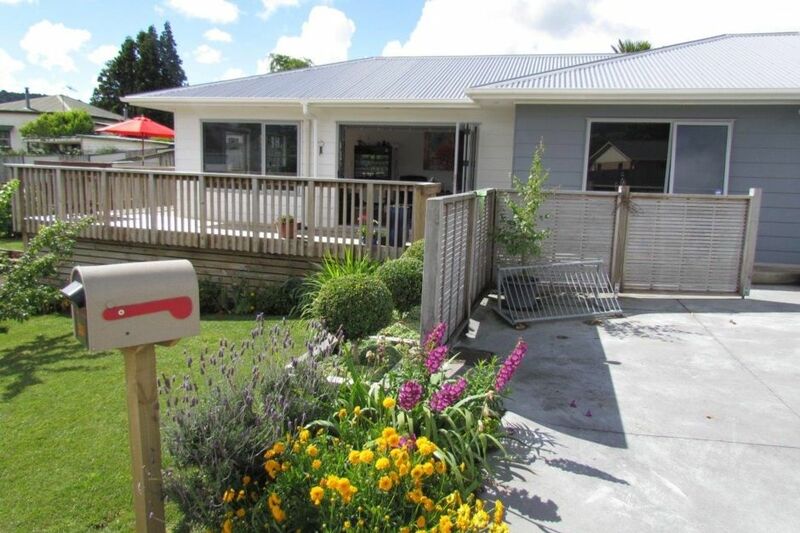 Very clean and comfortable property and an ideal location for Waihi and surrounding attractions. It was great to meet our guests and show them around the house as this is not always possible. We would have no hesitation in renting to them again they would be very welcome. The guests were so easy to deal with and great to communicate with. Well equipped. Clean, homely and comfortable. Stayed 3 nights.Kitchen was well equipped. Great shower. Comfortable armchairs. Appreciated the heat pump on the hottest evening, other nights we just opened the doors to the deck. Nice central location for beach and bike rides. Good off street parking Would stay again. Great location and facilities. Modern comfortable home away from home. House had everything we needed. Very friendly welcoming hosts. Great base to explore Waihi and easy drive to explore the beautiful Coromandel. Great swimming, walks and cycling. Hope to return again. Many happy times here. Thank you. This is a wonderful space! Very clean and well appointed with everything you could possibly need. The outdoor spaces are also awesome and lovely. I was very comfortable staying there and exploring the area from the very central location. A very positive experience! Thanks so much Brenda and John!